DASH BERLIN just confirmed that he will be adding Malta to the #Musicislife World Tour . The event is going to take place of the 12th of December ( Eve of a Pubic Holiday) at the Bay Arena in St Julian’s. He will engage fans in a performance that features a rotation of chart topping hits, fan favorites and new tracks from the #musicislife Deluxe album. For the Maltese show he will bring alongside him special guests Emma Hewitt and Chris Madin to perform at the concert. The past four years have all caused a reverberating bang when it comes to the Dash Berlin sound. From the ‘United Destination’ compilation series, which reflects his recent gigs with a top selection of tracks straight from his record bag into two seamless deejay mixes, to making a great rise in the DJ Mag Top 100, taking in a solid number 7 position. 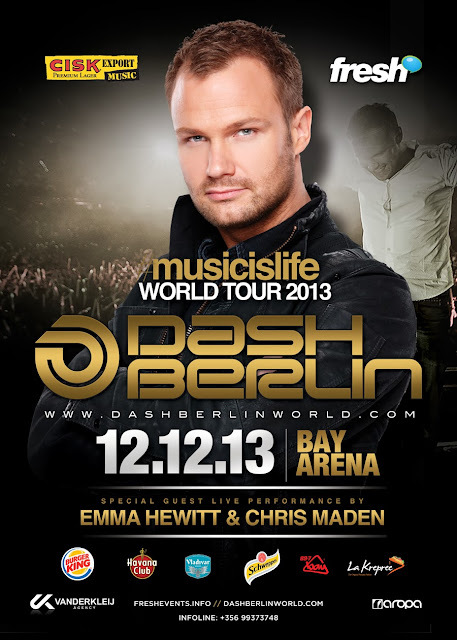 2013 promises to be another momentous year for Dash Berlin. A year all about the follow-up of ‘The New Daylight’. With his brand-new ‘#musicislife’ album, aptly named after one of his most popular Twitter hash tags, the ‘Flying Dutchman’ shows no signs of slowing down and is all set for his monster #musicislife World Tour. Dash Berlin’s much anticipated follow-up record contains signature hits such as ‘Disarm Yourself’, which features the angelic vocals of Australian singer Emma Hewitt, ‘Better Half Of Me’ & ‘World Falls Apart’ the epic duology with top vocalist Jonathan Mendelsohn, the magical team up with German DJ superstar ATB on ‘Apollo Road’ and of course exciting new collaborations with artists such as Emma Hewitt, Shogun, Kate Walsh, Shanokee, Chris Madin, Hoyaa and Sarah Howells. British singer-songwriter Howells joins Berlin on his new single ‘Go It Alone’ accompanied by a gorgeous music video shot in South Africa. The video got half a million views within the first week of its appearance on YouTube. In the past years Fresh events held several sell out events at the Bay Arena with Top International Djs such as Tiesto, David Guetta, Armin van Buuren , Paul Van Dyk, Deep Dish, Richie Hawtin & Ferry Corsten amongst others.